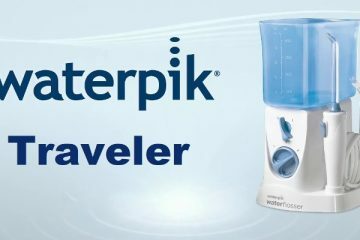 Waterpik WP-250 Nano Water Flosser is primarily designed for individuals who travel a lot. To make the device easy-to-carry, it includes an invertible reservoir. So after you are done with flossing, just flip the container, use it as a protective cap for the base unit, put it in your bag and you’re all set! This compact Waterpik solution is also a great option for kids who recently got braces or dental implants. It offers 3 pressure settings, ranging from 10-80 PSI. While it might not be huge compared to tabletop models, this should be ideal for people with broken teeth, sensitive teeth, and gumline. Despite being small in size, it works almost as good as any expensive portable water flosser. It supports both 110 v and 220v, so I can carry it to almost every country I go to for business purpose. If I am visiting Europe or Asia, I simply carry a universal plug adapter with me. I have seen many people confusing Waterpik WP-250 with WP-300. While both models look similar, they do share slight differences. I prefer the Nano model more because of its simple and straightforward functionality. To help you understand the product better, I want you to take a quick look at the main features it has to offer. 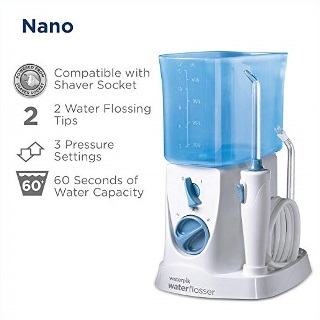 What Makes Waterpik Nano Water Flosser Special? 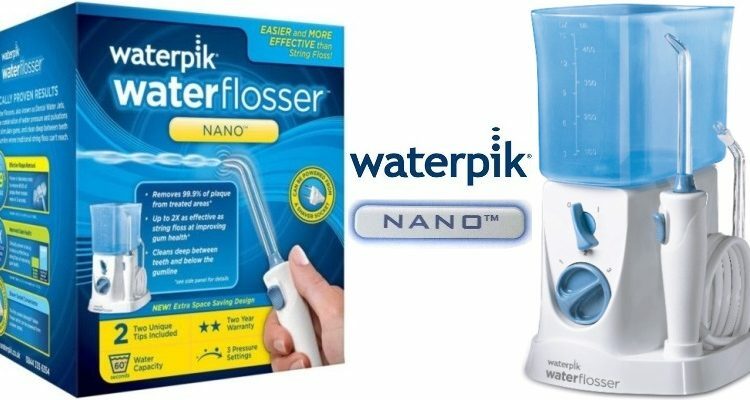 Is Waterpik Nano Water Flosser Worth Buying? 3 pressure settings- low(10 PSI), medium (45 PSI) and high (80 PSI). Comes with 2 tips- one classic jet tip and a Plaque Seeker Tip. Reservoir capacity-450 ml or 15 Oz. Provides a usage time of 60 seconds. You can use mouthwash in the fluid container. Invertible reservoir for the ease of portability. Operates on 110 v and 220 v. If you are in a country that uses a different voltage, use a plug adapter. Compact, not taller than 7”. 2 tips including a classic jet tip and a Plaque Seeker Tip specially designed to deeply clean braces, crowns, bridges, and dental implants. Small and compact water flossers are infamous for being not powerful enough to remove stubborn debris from the gaps of your teeth. I was worried about the same before buying this model. But when I used it for the first time at 80 PSI, I could actually see food particles on my sink. I thought brushing already removed all the junk from my teeth. My hygienist was right all along then. Brushing alone is never enough. The highest pressure setting of this device is perfect for me as I have a sensitive gum. It gives my gums a gentle massaging sensation. I’ve tried string flossing and it hurt my gums so much that it would bleed. Another special thing about all Waterpik models, including this one, is that they all are backed by ADA or American dental association. If we go by the reports of ADA, this Nano device is 50% more effective than string flossing. 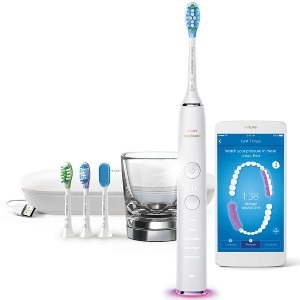 Also, if used correctly, it can force out 99.9% dental plaque under 3 seconds from the targeted area. Cool, huh? 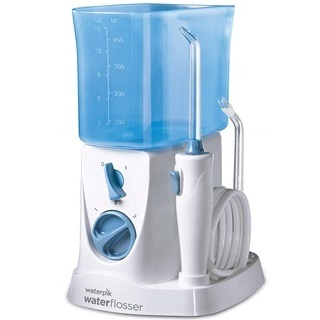 I compared the size of it to stationary water flossers of Waterpik. It’s almost 50% smaller. I never have to struggle to find a space for it in my luggage. When I’m at home, I keep it near my sink in my small bathroom. It doesn’t clutter the space at all and I love it. Water WP-250 model’s dimension is just perfect for traveling purpose. It fits easily in my carry-on airplane bag. The free travel case keeps the tips and power cord safe. The design of the travel case deserves some praise too. The inside of the case is thickly padded. So even if you accidentally drop the bag, don’t worry about the damage. There are two slots on the front of the base unit. On the left slot, you’ll find the additional Plaque Seeker Tip and on the right side, you’ll see a flosser handle which has the classic tip fitted to it. In order to change the tips, you have to click on the eject button on the handle, fit the tip into the hole on the handle. If you hear a “click” sound, it means that the tip is securely locked into place. Unfortunately, there are no control buttons on the handle. I would have really liked the pressure control dial on the handle. Also, it doesn’t have any button to pause the water flow. Unlike most advanced models, it lacks a 360-degree rotating tip as well. So, hold your mouth really close to the tip and swivel it in different angles to get a good clean-up. If your mouth is not close enough, the tip will squirt water and create a mess around your sink. The space-saving, invertible design of the fluid container is another cool feature. The capacity of the tank is 15 oz. or 450 ml which is quite large for a portable water flosser. I mostly use the high-pressure setting without having to refill. The tank has measuring lines on it which is beneficial for those who use some kind of oral medication while flossing. You can also add mouth freshener in the tank if you wish. For better cleaning action, I dilute the mouth freshener with lukewarm water. While most portable piks offer 3-4 tips, it comes with only two. That’s not a problem since I use it alone. The classic jet tip is my favorite as it is easy to maneuver inside my mouth. It also has a Plaque Seeker tip with soft bristles on it. It is ideal for gently cleaning plaque, debris, and bacteria around braces, crowns, and dental implants. Here’s another good news for you. 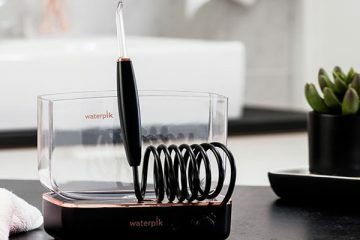 You can buy additional tips too for multiple users since it supports almost every Waterpik flossing tip. I have to admit that the low and medium pressure modes don’t have much power to flush out stubborn food particles from your teeth. But the 80 PSI setting is intense enough to provide deep cleansing. Unless you have injured or extremely sensitive teeth and gum, you might want to start right away with the highest setting. However, those who have used a countertop model before will find 80 PSI underwhelming. But you should also note that Nano is primarily designed for kids with braces, people with severe teeth sensitivity problem and travelers. Keeping this mind, I think that the pressure output is sufficient. 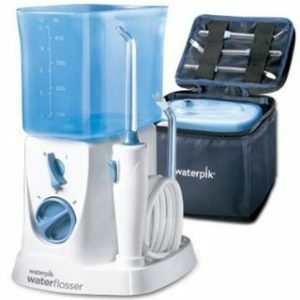 This is another department where Waterpik Nano Water Flosser excels. The top of the fluid container is dishwasher safe. Just remember to remove the valve before tossing it in the dishwasher. When the reservoir is washed and dry, put the valve back on. Never ever use the flosser without the valve otherwise it will leak water everywhere. Since there’s no cover on the tank, there’s is a risk of getting hard water stains inside the container. To prevent this, make sure to dry out the tank completely before putting it back in the bag. I wish the handle was designed better. It could have included a water stream pause button, a 360-degree rotating tip, and a dial to control the direction of the water. But looking at the price, I don’t think I should complain. 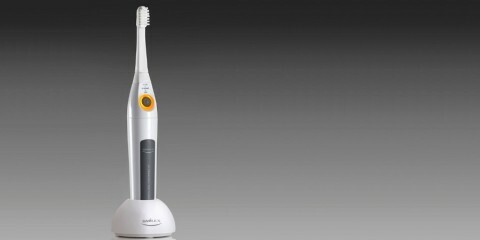 Apart from the usual features, the Waterpik WF-250 has many tiny but significant functionalities as well. For example, the ability to use oral medication and mouthwash in the tank, the large size and invertible design of the reservoir. It also supports dual voltage. With the help of a universal plug adapter, you can use it in any country. It’s lightweight, compact and doesn’t require much maintenance. The pressure is also good enough for day-to-day interdental cleaning. 450 ml capacity tank in a device this compact is incredible. Given the price range, I genuinely feel you will get full value for your money. The device works with both 110 v and 220 v without any plug adapter. Huge tank capacity of 15 Oz. or 450 ml allowing a runtime of 60 seconds. Thanks to the invertible reservoir, it is very easy to pack in a carry-on bag. The small handle provides a good grip and is easy to maneuver. 3 pressure modes to help you customize your cleaning needs. You can buy extra flossing tips in addition to the two tips included in the package. Premium design of the travel bag. The power cord could be a little longer. Might not be ideal for people who want intense water pressure for deep interdental cleaning. WP-250 is affordable, convenient to carry, use and maintain. That’s pretty much all you need to ensure good dental care while traveling. I am also planning to gift it to my 8-year-old niece who is about to get braces. The size and simple functionality will be perfect for her. It is surely not as good as the tabletop, bulky flossers but can you carry a big, bulky flosser to your vacations or business trips? No. But you can take Nano flosser wherever you go. Now you decide the rest.